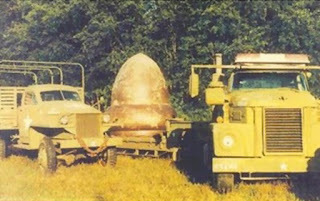 Jim Romansky waited 20 years before telling anyone that he was face-to-face with a UFO that crashed in the woods outside Kecksburg on Dec. 9, 1965. “I didn't want to be a candidate for the hospital down the road,” said Romansky, 69, of Derry, a retired machinist who at 18, was one of the first firefighters on the scene. He'd do the same today, he said, with the 50th anniversary of the incident set to occur Wednesday. “If a flying saucer lands in my back yard and little green men come out, I won't even tell my neighbor,” said Romansky, who was ridiculed by some Kecksburg residents who didn't believe anything happened that night. “Half of the town believes the UFO story, the other half doesn't,” he said. For half a century that debate has split the town. Romansky was a volunteer firefighter in Lloydsville when the siren went off that cold, wet night in December. He took off running the 200 yards from his house to the fire hall and jumped on a truck that was headed out. Once there, his crew joined firefighters from a number of other companies who divided into teams to begin the search for survivors. The metal object, large enough for a man to stand in, had no windows or doors and included what Romansky described as hieroglyphics on the side. “I'm looking at it, what the heck is it? This is no airplane,” said Romansky, who got a few feet from the object but did not touch it. As about 8 or 9 firefighters looked it over, two men in trench coats, one carrying a square box, came over the hill. He has thought about that night a lot over the years. Ron Struble thinks the device was manmade. “Something we put up and lost or it came from overseas,” said Struble, 72, of Kecksburg. Story refuses to go away, journalist says former Trib reporter Robert Gatty had just returned to the office from covering a meeting when managing editor Tom Aikens Sr. called him over. “I have the story of the century for you,” Aikens said, laying out the details for his rookie reporter. He arrived in Kecksburg to find almost two dozen military personnel lined up around the site. “I went up to the first guy and said, ‘What's going on?' and he said, ‘Nothing,'” Gatty said. When it became clear he would not get access to the site, Gatty turned to townsfolk who were milling around nearby and found a few willing to talk. “They said it hovered and landed,” Gatty said. And this is coming from a reporter who, admittedly, covered some other events of historical significance in the annals of American history, including the aftermath of the assassinations of Robert F. Kennedy and Martin Luther King Jr., along with the 1968 Democratic National Convention, for United Press International, Gatty said. Today, Gatty serves as editor-in-chief of Convenience Distribution Magazine, a publication of the Convenience Distribution Association, and as editor of HIV Specialist magazine, a publication of the American Academy of HIV Medicine. “Nothing has stayed with me like the Kecksburg story has,” he said. Gatty annually gets attention as the anniversary date of the iconic incident approaches, he said. July marked the 10th annual installment of the Kecksburg Volunteer Fire Department's Kecksburg Old Fashion Days & UFO Festival at the fire company's grounds located at the intersection of Claypike and Route 982 in the township. Beyond debate is the benefit of the event as the organization's main fundraiser, said Duane Hutter, the department's president and a township supervisor. “It means a lot to the fire department, because it's how we (maintain) our equipment and our buildings,” he said. For the first time, several of the incident's witnesses attented a conference dedicated to reflecting on the happening. The witnesses discussed their experiences and conducted a question-and-answer session. Throughout the decades, many of those people faced much ridicule for testifying to what they claimed to have seen, according to Stan Gordon, a Greensburg resident and author and researcher of unidentified flying objects. Many of those Gordon interviewed were children or teenagers at the time and later, because of their professional positions, asked to remain anonymous, he said. Gordon presented an illustrated lecture discussing his 50 years of investigation of the case, and he screened excerpts from his award-winning video documentary, “Kecksburg: The Untold Story,” which focuses on interviews with area witnesses, he said. He also updated attendees on more recent reported UFO sightings, purported Bigfoot encounters and other happenings reported from around the area, he said. Visitors also encountered displays prepared by John Ventre, director of the Pennsylvania Mutual UFO Network; Fred Saluga, director of the West Virginia Mutual UFO Network; Jim Brown of jimsdestinations.com, a website devoted in part to paranormal studies; Brian and Terrie Seech of the Center for Cryptozoological Studies; Dave Dragosin, associate director of the Western Pennsylvania branch of the PA Bigfoot Society; Ryan Cavalline and Dave Rupert of The Legend Hunters; paranormal site investigators Cheryl Alsippi and Darlene Koedel; and Diane and Jim Trick of the Goosebumps Paranormal Society. “The money we raise is well used, and every dime goes to the fire department,” Hutter said.